Summary: The Republic of Kosovo has continued to receive diplomatic recognition from other countries, despite widespread opposition to its 2008 declaration of independence from Serbia. Thirteen more U.N. members have declared their recognition of independent Kosovo just within the last year. 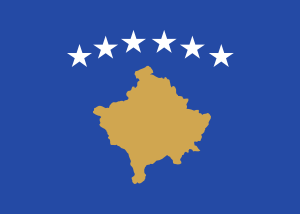 Flag of the Republic of Kosovo. The majority of recently independent countries, such as South Sudan and Montenegro, enjoy unopposed recognition from the U.N. and its members. However, acceptance into the international community doesn't always come so easily. Kosovo is one example: because it declared its independence without first coming to an agreement with its former host country (unlike South Sudan and Montenegro), it has struggled to gain acceptance as a sovereign state. The last of the Balkan countries to declare independence after the breakup of Yugoslavia in the 1990s, Kosovo was first separated unofficially from the country in 1999, when NATO intervened militarily in the province to stop Serbian government violence against ethnic Albanians. The Albanians are a cultural group from southeastern Europe who speak a unique language only distantly related to other European tongues, and like the Bosniaks in nearby Bosnia & Herzegovia, are one of the few majority-Muslim European peoples. They also form a majority of the population in the neighboring country of Albania. Policed by a U.N. peacekeeping mission since 1999, most of Kosovo has never since been controlled by the Yugoslav (now Serbian) government, though the U.N. still officially considers it to be a province of Serbia. Despite fierce political opposition from Serbia, Russia, and other countries, as well as from the ethnic Serb minority within Kosovo, the local government declared independence in 2008. 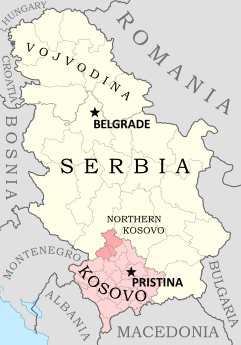 The self-proclaimed Republic of Kosovo government has since administered the territory alongside the U.N. and another police force sent by the European Union, though the Northern Kosovo area, a Serb-majority region, has resisted independence and continues to support the Serbian government in Belgrade, even setting up roadblocks to keep out the Kosovan police - a sort of breakaway state within a breakaway state. The Republic of Kosovo has not been admitted into the U.N., and it is recognized by only 88 U.N. member countries (many of them NATO members or countries with Muslim populations) and one other state (Taiwan). Serbia and Russia still strongly oppose independence for Kosovo, but the list of states recognizing its sovereignty has nevertheless continued to grow. Within the last year, 13 more U.N. members have offered diplomatic recognition of Kosovan independence: Andorra, the Central African Republic, Guinea, Niger, Benin, Saint Lucia, Nigeria, Gabon, Ivory Coast, Kuwait, Uganda, Ghana, and Haiti. Diplomatic recognition of the Republic of Kosovo. Countries that recognized Kosovan independence recently (in the last twelve months) in light green, others in dark green; Kosovo in magenta. Public domain (source). Sources: See citations on Wikipedia's list of Entities that recognize Kosovo as an independent state.